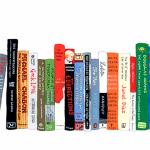 What are the most frequently read books by academics in the United States in 2015? What are the historical, temporal, and geographic peaks and valleys in reading surrounding certain books or literary collections? What books are largely read for studies on, say, “Twentieth-Century American Literature?” What books do we read under times of national stress, such as post-September 11th? The assumption since the canon wars ended in the 1990s is that our canon is more inclusive, more progressive, more expansive in what it deems as literary value. How would quantitative analysis respond to such an assumption?